This has been a summer of goodbyes. Mary got married and moved to Nashville. Mercy left for South Korea. Lina left for Zambia. All of these goodbyes were hard, but the last one was the hardest. Mary is not all that far away (only 600 miles! ), and I know I’ll see her again before the end of the year. Mercy is fulfilling a dream and having the time of her life, and I know I’ll see her again at Christmas time. When Lina leaves, however, it is different. The length of the separation is not known. I may see her again in a year and a half–or it might be two or three years. If her support level is not adequate to enable her to save up for a trip to Texas, it might be a very long time. It is this open-ended nature of the farewell that makes it so hard. We must say goodbye without any relief in sight, without knowing if it might be many years before we see each other again. And this is all over and above the reality that she has been here for five whole months, during which I had a constant companion, knitting buddy, chauffeur, video friend, kitchen helper, tea drinker, and conversation partner. I enjoy her company so much and since her visit was longer this time, it was easy to just drop back into a routine that included her. Going back to a routine that does not include her is much harder. So, this morning I “slept in” till 7:30 and then as I was still lying in bed trying to summon up the will to rise, I got a call from Lina. She was safely in London–in Trafalgar Square–and once again her debit card had been frozen. This has happened every single time she goes overseas. We inform the credit union well in advance. This time we actually went over it with them twice! Yet Lina got there and was unable to use her card. I tried calling the credit union at 8:00 but found they don’t open till 8:30. So Lina was able to make her way to the Tower of London, but she couldn’t buy a ticket to get in! Finally 8: 30 rolled around and I had a long conversation with a clerk at the credit union during which we went over the exact same information for the third time. She assured me that Lina’s card would be released, so I texted Lina the good news and she tried to use the card and it was rejected again! So frustrating! I told her to wait a few minutes and try again, just in case it took a few minutes for the process to be completed. Then I got a phone call from the credit union saying that all was well, and this time they were right. Lina tried again and this time it worked! So she was able to enjoy her tour before heading back to the airport to catch her flight to Zambia. It was a quiet day here. I started downloading the last of my old blogs and then Xanga went offline. They are switching to a new server, so I should be able to get those last few months soon. But meanwhile, since I couldn’t do that, I did other things between naps. I have learned over the years that I am deeply affected by emotional exhaustion as well as physical exhaustion, and today was a prime example of that. I did get some sewing done and some school prep stuff and a little bit of reading and knitting. I also made a massive batch of coleslaw, which is something I only do once every several years. This weekend’s going to be wild. Going to a party, but also throwing a party two days in a row. So much for life slowing down! Last night I was too tired to post. I am still too tired, but I’m going to give it a try anyway! Yesterday morning was very stressful. Lina was packing, and she was under a lot of pressure because we had intended to leave by noon. During the morning, Lucy was cleaning the mouse cage to help Lina out, and she brought little Claudia down for me to hold. So I was petting her and I noticed that her left front leg seemed to be trailing. I turned her to get a better look and saw to my horror that her foot was missing. Gone. Not only was it gone, but the wound had healed, so obviously it has been missing for some time. I was so dismayed. There have been a couple of occasions when Neko has sneaked into the girls’ room and knocked the mouse cage down. Both times Claudia got out and Neko was in pursuit before being caught. I guess that one of those times he was more successful than the girls realized. I have to admit I was in tears at the thought of that poor little mouse suffering and terrified and we did not know it. I was also surprised that the injury was not discovered earlier, though Lucy did admit that Claudia hasn’t been running on her wheel lately. Poor Lina was very distraught when she saw what had happened. She really didn’t need that added to her already high stress level. There were a lot of tears all round, actually. The noon deadline came and went. Plans were changing by the minute. Finally, at a little after 1:00, Lina got into the Delta Flier (her car) for the last time and we followed her to Missionary Tech Team, where she turned the car in and then joined us in the van. It was a 101° day and we were in a non-air conditioned vehicle. It was a rolling steam bath. As we approached the exit where we normally stop for middle-aged ladies to use the restroom, Lina got a text from Mary informing her that Starbucks was selling their pumpkin spice lattes ahead of schedule. This drink is one of Lina’s favorite things in the world, and she was so sad that she’d be leaving before this seasonal drink returned to the menu. So, obviously we stopped at Starbucks instead of McDonalds so that Lina could get her latte. I got a couple of bottles of cold juice for Walter and me, and then the begging began. Lucy wanted a drink. Jasper wanted a drink. Spencer wanted a drink, and had money, so he could buy his own, but at that point I felt we really needed to conserve cash and we had plenty of water in the van, so I vetoed the expensive coffee drink plan. Well, unbeknownst to me, a lady had been paying attention to our little drama and she stepped up and offered to buy drinks for all three kids! Furthermore, she gave Jasper an extra $3 “just in case.” When she heard that Lina was a missionary returning to Africa she was so thrilled and said that if we needed her to she’d even take Lina to the airport since that’s where she was going as well! The kids thanked her profusely and I was so touched by her gesture. Meanwhile, though, Walter had been on the phone with Flynn and we had to change the plan yet again. We had hoped to go to Flynn’s place and hang out for a while and give Lina a chance to change into her airplane clothes, but as we looked at the time we realized that we should just head straight to the airport, and Flynn could meet us there. By the time we reached the airport I at least was drenched with perspiration. It was such a relief to walk into the air conditioned terminal. Lina eventually got her luggage checked and Flynn eventually arrived and we had a few minutes together as a family before we realized that Lina should get into the line for the security check before it got any longer. There was a round of goodbye hugs. Surprisingly, I managed to stuff my sorrow down sufficiently to keep the tears at bay for the time being. It is hard to send two daughters overseas in one week! We stayed there by the security line, talking with Lina while she was still close enough, and then watching as she finally reached the conveyer belt and went through the scanner. After she got all her stuff back and her shoes put on, there was a final wave and she was gone. We went back out into the brutal heat, got into two stifling vehicles, and headed over to Flynn’s place. He knew of a deal for half-price pizza, so he ordered some while we started the cooling-off process all over again. It was too bad that we had to wait quite a while for the pizzas, because we still had a three-hour drive ahead of us and Walter and Spencer still had to go to work! Then when the pizza guy came, he was one pizza short and had to go back for the other one! So, it was very late when we left Flynn’s and we did not get home until close to 11:30. Walter and Spencer left immediately for work and returned shortly at about 1:00 a.m., after which Spencer still had some homework to do. Poor Walter has a full day of work today plus a longer-than-usual evening at work tonight. I do not know how he does it. I know I say it a lot, but he is the hardest-working man I know. Today was Lina’s last day. She spent a lot of time packing, but she did take time to go to the historical museum with Lucy and Jasper. Meanwhile, I test drove the van up to the fabric store in search of a few last-minute items. Lina had found a skirt which has a lining, but the lining is not adequate, so I was looking for some matching purple fabric that was 100% cotton. I didn’t find any, but I did find some white batiste and some purple dye. After lunch Lina dyed the fabric and then we went in search of vitamins and olives and feta cheese. Then I took Lina to get some frozen yogurt so she could cross one more thing off her list. The farewell dinner was lasagna. We also made some olive and feta salad. Walter had to work, of course, and then he took the van back to the shop. Eventually he returned with the news that he thinks the van is fit for the trip tomorrow. Lina was so far along with her packing that she took time to watch a movie with Lucy and me, while I continued to download my old blog entries and finished with 2012. Only five more months to go! 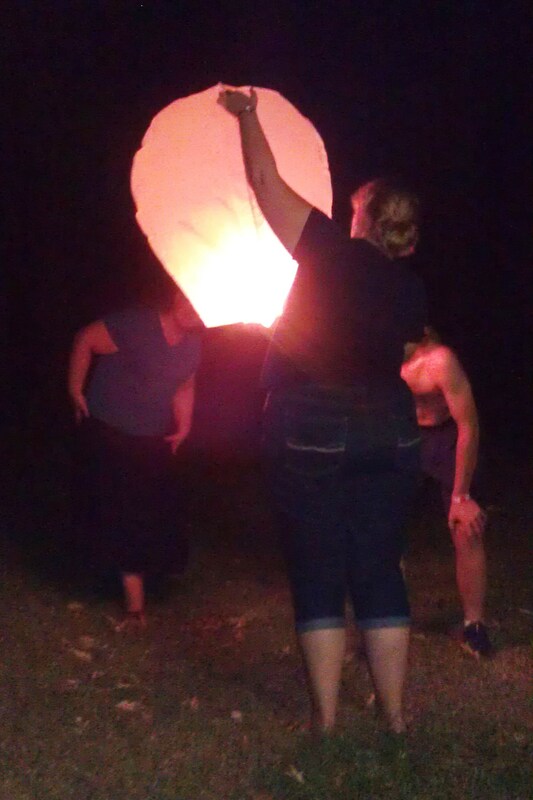 Then, at midnight, Lucy talked Lina into launching the sky lantern that I had gotten her at Boomland. Before that, I did not know that sky lanterns were a real thing. I mean, I thought they kind of made them up for Tangled. So anyway, we went out to the patio and the kids got the lantern opened out and then carefully lit it. I was surprised at how much fire there was! And it suddenly occurred to all of us that there is a burn ban on because East Texas is dry as dust. Lina asked if she should release the lantern and I said yes, because I was thinking it would rise maybe 20 feet in the air and then sink gracefully to the ground. Boy was I in for a surprise. 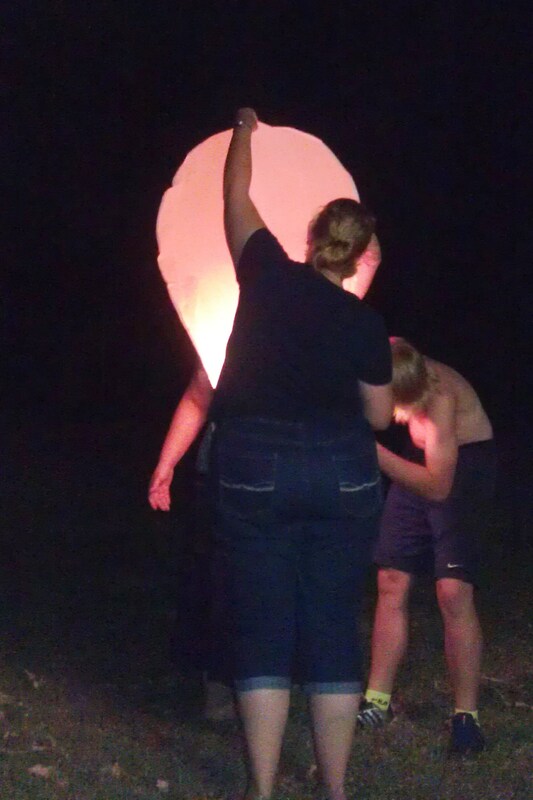 When Lina let go of the lantern it literally shot into the air. It went right up into the pine trees and we all held our breath and prayed that the pine trees would not catch fire. Then it blazed free of the trees and rose higher and faster, blown by the wind till it was just a tiny blazing speck in the sky. We watched the speck as it dimmed and then vanished. Who knows where the remains of that thing landed? I just hope that by the time it fell to earth it was cool enough to not be a fire hazard anymore. It was beautiful to watch and I wish we had a fleet of them to set off at Christmas time. I hope no one thought they saw a UFO. Today Lina’s agenda was to get as many errands run as possible. My agenda was to prepare for and teach a class, and to help Lina in any way I could. Lina was out running around most of the day, it seemed. Meanwhile, I prepared for my class and then after lunch my students arrived. I have two “new” students this year and I am looking forward to working with these fine young people. They are all kids that I have known for some time. This was an “orientation” class, so one of the things I did for fun was to have them write short stories. To make it more interesting, I had asked friends on Facebook to contribute nouns and verbs. I put them on pieces of paper and then picked some that everyone had to use, plus each student had to draw an additional noun and verb to use in their story. The stories were interesting, especially since everyone had to include a dog and a monkey! The horrific discovery came at supper time. Spencer fried up some meat patties and we sat down to a hamburger dinner. Lina was just about to bite into her burger when she saw something. Something alive. There was a weevil living in her hamburger bun. And another one . . . The boys looked at their own buns in dismay and saw that they were similarly infested. Jasper was beyond disgusted because his burger was already half eaten! We checked the date on the bun package and saw that the buns had been past their expiration date at the time that I had bought them. Oops. I rarely check the dates on baked goods. For once I was glad to be eating my bunless burger! This evening, while my poor husband worked on the van again, I did more blog downloading and some sewing for Lina. One more full day to cram everything in! And possibly, the van might be ready for a test drive tomorrow. Just in time to drive Lina to Dallas in 103 degree heat with no air conditioning. Oh, and if you’re interested in following Mercy’s adventures in Korea, you can find her blog here: http://mercyinkorea.blogspot.com/ I’ll also post the link on my links page. Yesterday was a very unusual Sunday for us. Lina had been invited to speak about her ministry at Sakeji at a church about an hour and a half’s drive from here. It was a little sad that she didn’t get to spend her final Sunday here at our own church, but we were thrilled that this other church had shown an interest and wanted to hear about Sakeji. The man who had set it up often comes to speak at our church, and he had told Walter that after the regular service, there would be a potluck, and that after that Lina would be giving her presentation. Well, I’m a potluck pro. I had Lina make a double batch of cherry crunch on Saturday night. I made a slow cooker full of my famous scalloped potatoes and in the morning I sliced up several pounds of ham. We decided to just go to the second service so that the food wouldn’t be sitting out in the trunk for too long, especially since it was such a long drive up there. Walter stayed home to work on the van (because it REALLY needs to get back on the road) and Spencer went to church with friends, so it was just Lina and me and Lucy and Jasper. I have to admit I was dying of curiosity. We have heard so much about this other church from people who have visited there, but we had never been there ourselves. We were expecting a congregation much larger than our own, and of course a significantly larger building. I was guessing that there would be at least 80-100 people in attendance. The church is located in a tiny community called Golden. We had to use our GPS to find the church, which was surrounded by fields. The parking lot was grass, and shaded by trees. The building was smaller than our house, I’d say. We arrived just as the first service was ending and were offered cake and coffee. I was surprised to see that the congregation was about the size of ours (30-35 people) and the sanctuary was smaller. We were greeted with great enthusiasm and kindness. A family that used to attend our church now attends this church, so at least there were some people that we knew. The service was good and in fact there may be an essay coming at some point. After the service, as they began setting up for the dinner, I realized that my information had been incorrect. It was a “fellowship dinner,” but it wasn’t a potluck. The church had purchased bread, chips, and two huge platters of cold cuts. I explained that I had brought food and would like to share it, and they allowed me to put my potato casserole and ham on the main buffet table, and my dessert on the dessert table. I felt very awkward, but what could I do? Everyone kept telling me I shouldn’t have brought food. We were sent through the line first, since Lina was speaking afterwards. Of course I could not have a sandwich but I found that cold cuts and cheese are quite good on potato chips! As more people got through the line and sat down to eat, I started getting comments on the potatoes. Everyone loved them. Our friends remembered them from potlucks of the past and spread the word. I got so tickled by how many people raved about the potatoes while at the same time assuring me that I shouldn’t have brought them! There was very little left by the end of the meal. Lina did a great job on her presentation and I was very proud of her. The people seemed to enjoy it also and asked quite a few questions. It was hard to drag ourselves away from such nice people, but eventually we headed home. 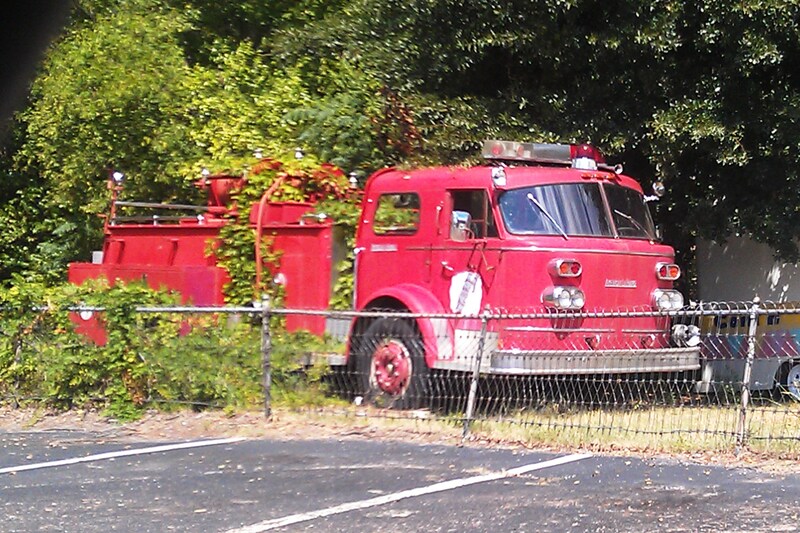 It was a hot day, so we stopped to get drinks in the nearby town of Mineola, where I saw this lovely old fire truck enjoying a peaceful retirement. Today we covered some of the same ground that we did yesterday. Lina had arranged to have lunch with her friend Rae, and I went along to spend time with Lina and to take her somewhere I thought she’d enjoy afterwards. It was about a 45 minute drive to the restaurant. When we got there, I walked next door to a fast food place and had lunch with Winston Churchill while Lina and Rae enjoyed their get-together. Churchill has been sadly neglected as I’ve been forced to spend every spare minute downloading blogs. It was good to spend a few minutes in his world, even if it was in World War I. After lunch Lina and I headed down to a store where she was able to cross another item off her list, and then we headed down country roads to cross over to Henderson, where we popped in on Jean, our dear friend who is in her 90s but still goes in to work every day. She was thrilled to see us and we enjoyed a brief visit so that Lina could say goodbye to her. Then it was back home, with a stop to do some banking for Mercy. Minutes after arriving home, we were sent out again to get some motor oil, so we picked up a few other things at Sam’s while we were at it. I was so tired when we got home again! Speaking of Mercy, by the way, she is safely in Korea and at her university. She had to sleep on a bare mattress last night with only her towel and a hoodie as bedding! Hope she can get some linens today . . . This evening involved plenty of blog downloading and also some sewing. We are running out of time! Somehow, I’ve got to be ready to teach a class tomorrow. What was I thinking? Everywhere That Man Can Be . . .
We sang this wonderful hymn in church this morning and it brought tears to my eyes. 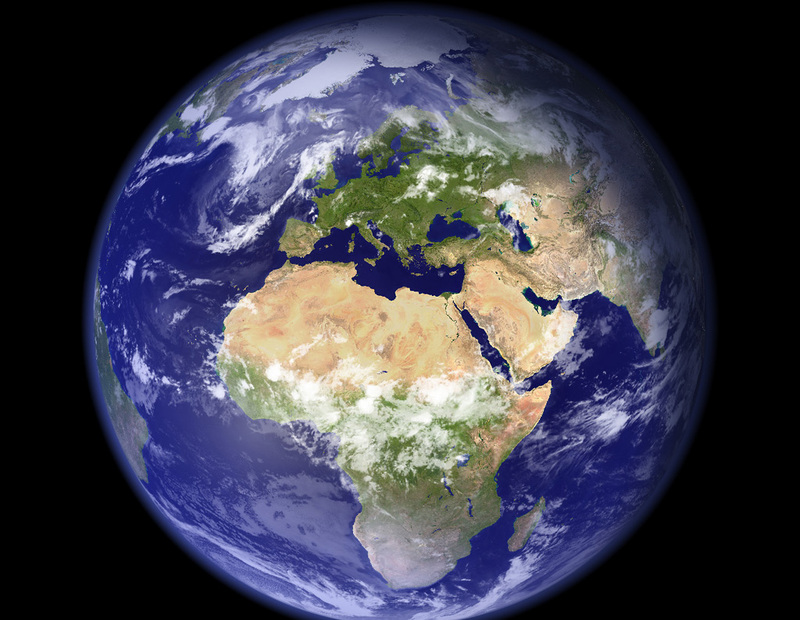 With one daughter currently on her way across the Pacific Ocean to Korea, and another daughter poised to go back to Zambia, I am so glad to know that there is nowhere on this lovely planet that anyone can go that lacks God’s presence. No matter where my loved ones are, He was there first and is with them even now. Makes worrying seem kind of silly, doesn’t it? So, did anyone miss me? Last night I just enjoyed being with my family and did not want to take time out from Mercy’s last night at home to write a blog entry. Yesterday she still went to work in the morning. Meanwhile, Lina and I went shopping. Lina has just a few days left and was trying to get some things on her list to take back to Zambia. I, meanwhile, had to work on vocabulary. I have almost no subscribers this year, but the work load is the same. I am doing a whole new year for middle school and I have to admit it is fun picking out the words. I just wish it wasn’t so tedious double checking all my other lists to make sure I’m not repeating any words I’ve already used. The English language is so rich and expressive. I love that there are so many different ways to say almost anything! We spent the afternoon getting ready for our nice supper. Lina made a birthday cake for Spencer and I worked on making groundnut stew, one of our family’s favorite meals. We knew supper would be very late, so Walter went back to work on the van after his normal work. Eventually, Flynn arrived and we had our late supper. Eight of us together for the last time in who knows how long! I just wish Mary and Jordan could have been here. We spent what remained of the evening talking and laughing and having cake and ice cream and watching a couple of short videos. I still managed to download my quota of blog entries for the day. Today, I was up early to go to Walmart with my stalwart little helper. For a special treat, we stopped at the donut place on the way home and got kolaches and donuts for breakfast. Due to the van being out of commission, Walter and Spencer had to borrow Flynn’s car to go do their yard jobs. Lina, Flynn and Mercy went out to do more shopping and get coffee. I had some sewing to finish up for Mercy. I had bought her a lovely kimono in a Tennessee thrift shop, and I had thought it had a belt, but if so I lost it. So I bought some fabric that was very close in color and today I finally got around to making the belt so she can use the kimono as a dressing gown while she’s in Korea. The fabric was very slippery and unpleasant to work with, but I should be used to that by now! The belt turned out just fine. Most of the day I had a massive headache, and it was my own fault, so let’s just say I learned my lesson. At least I got done what I really had to do. Shortly after Walter and Spencer returned, Mercy and Flynn were ready to leave. Mercy’s flight leaves very early tomorrow morning, so she is spending the night with a friend in Dallas who is willing to take her to the airport bright and early. I have known for months that this day was coming, and have chosen to focus on what a wonderful opportunity it will be for Mercy. I did not allow myself to dread this day, and I’m glad I didn’t. I really didn’t dwell on it much at all, and then suddenly there we were in the driveway and there were tears and I realized that you really can’t prepare for these goodbyes. They always hurt, because you are saying goodbye to someone you love and know you will miss. Right now, I’m still trying to absorb it. It seems impossible that she simply is not here anymore! At the same time, I am so thrilled for her as she begins her new adventure. And it helps to know that I will see her again in four months. We all felt a little bereft after Flynn and Mercy left. We had leftovers for supper and Walter went back to work on the van. We are a little anxious because we are going to be in a really big bind if the van is not back in business by the time Lina has to turn her car back in! Despite the urgency of the van repairs, Walter did take some time to install another new part on the oven, in hopes that it would be the “right” one. 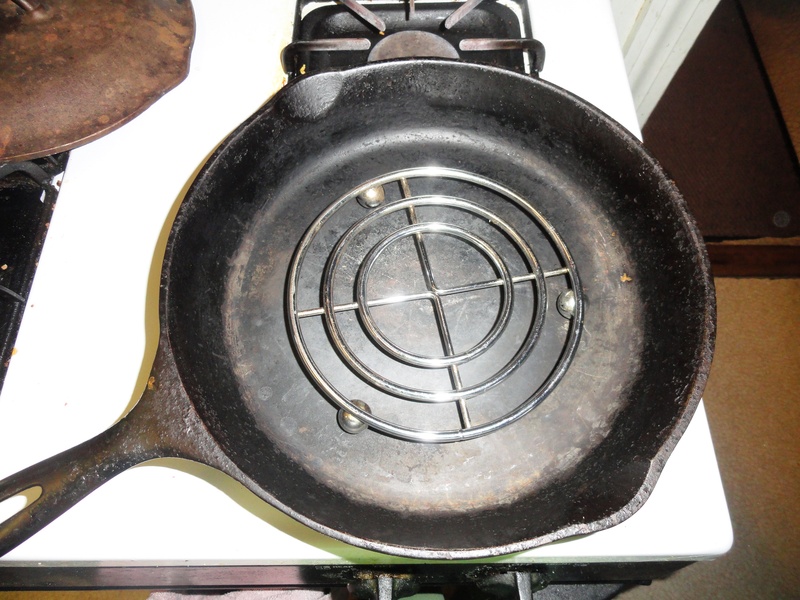 It preheated to 400° in only 10 minutes! Lina was able to bake the dessert we’re taking to a potluck tomorrow. 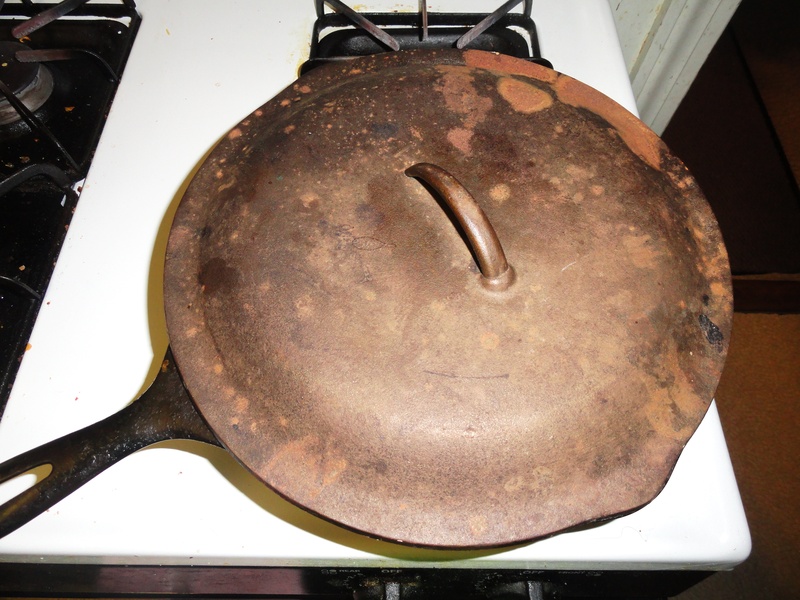 Oh, how lovely it will be to have a functional oven again! It is such a blessing to be married to a practical man. So glad he knows how to fix things and is willing to do it! Today was the day I looked forward to all summer. 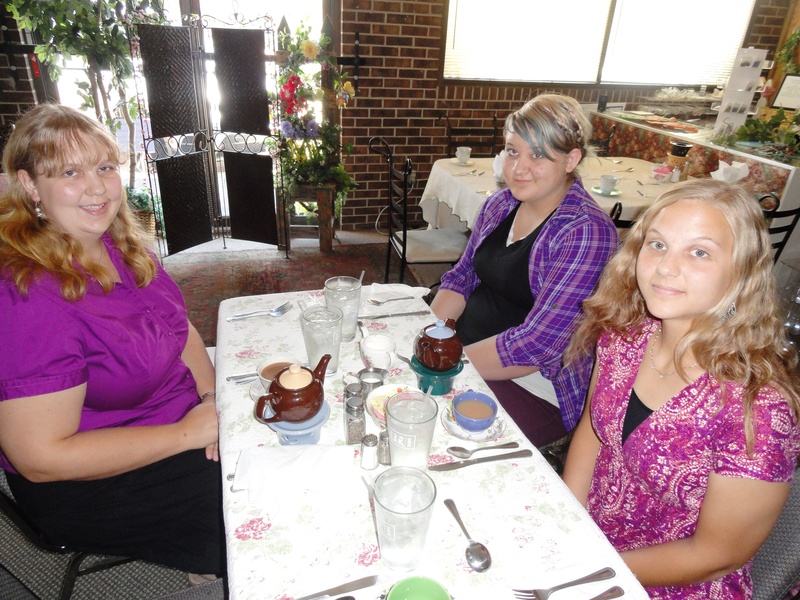 What I really wanted, my one big wish for this summer, was to take all four of my daughters out for lunch at my favorite tea room. I expected and hoped to do that in the weeks when Mary was here before the wedding. However, Mercy was unable to get off work, so those days slipped by and were gone. In effect, I had the choice of going without Mary or going without Mercy, and by default it ended up being a Mary-less outing today, because if I waited any longer both Mary and Mercy would not be here! Mercy worked all morning and then the four of us took off in Lina’s car. I had made reservations, but we left a little late and I was worried that they might not save our table for us (it was an hour’s drive away). Lina had been to the tea room before, but Lucy and Mercy had not. I wish we hadn’t had to hurry, but sometimes you have no choice! We had a delicious lunch but it had to be quick because Lina and I needed to get home for our Bible study. We barely had a few moments to glance at the gift shop before heading home. Robin was waiting in the driveway when we got here, so we brought her in with us and had our Bible study. After she left, it was time for my big challenge of the day: making pizza without an oven–again. Grrr! When I planned on pizza for this week I guess I just assumed the oven would be back in business by now. There was no way I was going to sweat over a 500 degree grill again. So, that left me with the following options: microwave, stovetop, roaster oven, and toaster oven. Lina, meanwhile, was doing three separate batches of pizza in the roaster and then finishing them in the toaster oven. People just got their supper when some pizza became available. The whole process took over three hours from start to finish. I proclaimed that there would be no more pizza until we have a functional oven! After supper Lina and I went to Walmart and got a few things, including supplies for tomorrow’s family birthday dinner for Spencer. Flynn is coming! Well, today was not as productive as I would have liked. Still, I got some sewing done, took care of some business, and downloaded the rest of 2010. That’s a relief. Only 29 more months to go! I also spent quite a bit of time figuring stuff out for the classes I’ll be teaching this year. I’ll have a high school English class and an elementary English class and no co-op classes. However, Lucy will be doing Biology with my friend Kim and there is still piano and 4-H and all our other schoolwork so it’s not like we’re going to be just lollygagging around. I would really like a couple of weeks to work on preparation, though, and I’m not going to get them! Only three more days with Mercy! Today was the day that Lina returned from her gallivanting off to visit friends in Montana and Ohio. Unfortunately, her plane was due to arrive shortly after 9:00 this morning. So, I had to get up at 5:30 and haul Lucy out of bed so that we could be on the road by 6:30. We left Spencer, the birthday boy, sleeping in his bed and had to be satisfied with texting him birthday greetings after he woke up. We had a rather uneventful trip to the airport, though Lina did arrive before us. That just meant we could pick her up at the curb and didn’t have to park! Lina, for her part, had been up till midnight and then had to get up at 4:30 to catch her flight, so she was in dire need of a highly caffeinated breakfast. We kept our eyes open for a Starbucks, and sure enough, we saw a sign indicating that there would be a Starbucks at an upcoming exit. Shortly after Lina pulled off on the exit, I saw a shop with a big sign saying “Yarn Heaven.” “Yarn!” I said. My practical daughter insisted on having her breakfast first, so we continued on to Starbucks, where we received excellent service and plentiful stimulants. Once fortified, we agreed we should go back and check out the yarn store, especially since I had noticed that the windows were plastered with big “SALE” signs. So, we backtracked to the yarn store and discovered that not only was there a sale going on–it was a “going out of business” sale. Everything in the store was a minimum of half off. We were greeted at the door by a friendly Yorkshire terrier, and once inside we encountered a majestic tabby cat who clearly believed that the shop was hers. It took us a while to evaluate our options and pick out the deals that we could not resist. Even Lucy picked out some yarn and promised to knit something from it! Yes! Eventually, we made up our minds and continued on our way toward home. There was one more detour–to a kitchen store at the outlet mall, where both Lina and I found things that we had specifically been looking for. It was good to get home, though the birthday boy was not here. He did eventually show up and we had supper, but not the official birthday supper, because that will come later. We finished off the day by watching a video of the birthday boy’s choice.